Llandeilo is a rural town near Carmarthen and Ammanford in Carmarthenshire with a population of around 3000. It is named after the early Welsh saint Teilo, the prefix 'llan' meaning a religious enclosure. The parish is called Llandeilo Fawr (Great Llandeilo) to distinguish it from several other Llandeilos in Wales, similarly dedicated to the saint. The town features some fine Georgian and Victorian buildings and the neighbouring locality has a number of medieval castles such as Dinefwr and the remnants of grand estates, including the famous Aberglasney gardens make the local countryside a fascinating area to visit. 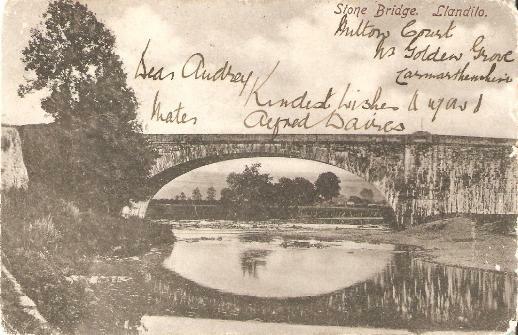 When first designed by William Williams and built between 1843-48, the stone bridge at Llandeilo, with a p of 145 ft (44 metres), was the third longest single p bridge in Britain. 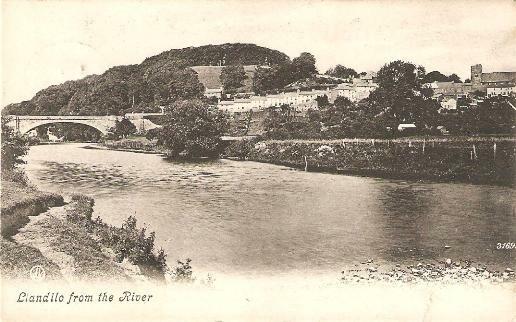 It carries the A483 over the river Tywi (Towy). Agriculture had good and bad times. 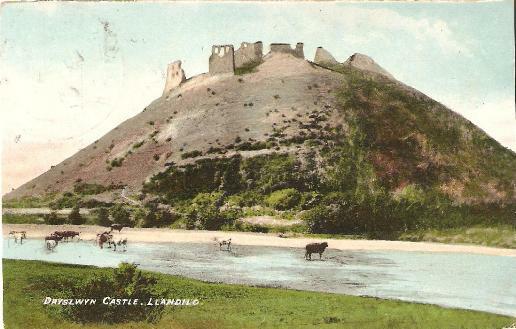 The Bristol Mercury of November 20 1820 reported that 'At Llandilo on Monday, and Carmarthen on Tuesday, cattle were not saleable at any price. Never was agricultural produce in such a state of depression and stagnation.' Again the Bristol Mercury of Monday, May 19, 1823 stated 'At Llandilo fair, on Thursday, the 8th instant, and at Llandilo fair on Monday last, there was but an indifferent exhibition of cattle, and the few sold fetched very low prices. The frequency of the fairs can be seen from references in Baner Cymru listing fairs at Llandeilo fawr on April 6 1857, May 15 1857, June 22 1857, August 23 and 24 1857, September 29 and 30 1857, November 12 1857, February 20 1858, . The Bristol Mercury, Monday, June 26, 1826: 'Carmarthenshire Election - Monday last was the day fixed upon by the High Sheriff, (William Du Buisson, Esq.) for the election of a Member to serve in Parliament for this County. - About ten o'clock the Sheriff, and a great number of Gentlemen entered the Town-hall at Llandilo, and after the writ had been read, and the usual ceremony gone through, the Sheriff called upon any elector to propose a Candidate. E.P. LLOYD, Esq. of Glansevin, rose, and proposed the Hon. GEORGE RICE TREVOR, as a Gentleman every way qualified to represent the County of Carmarthen. J.W.G. Hughes, Esq. seconded the nomination. No other Candidate appearing, the High Sheriff declared the Hon. GEORGE RICE TREVOR duly elected, amidst immense cheering.